MySB is small, secure and exceedingly simple to use – add tracks off your hard drive or drag-n-drop them into your playlist from our huge library of sounds. 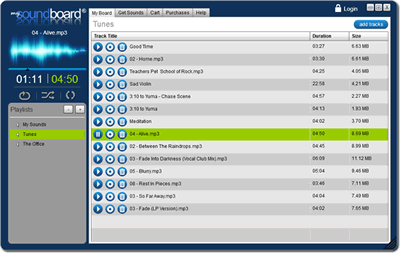 Displays your selected Playlist for play, sorting, editing and deleting. Also includes sort, loop, shuffle and play-all buttons and functions. The ‘Add Tracks’ button lets you upload local mp3 audio files to your Playlists. 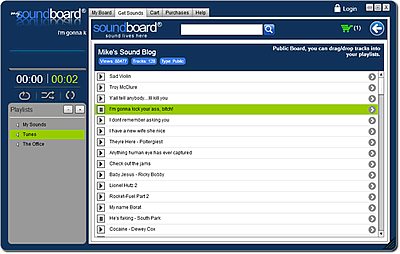 The 'Get Sounds' tab gives you full access to Soundboard.com's massive library of tracks. Want a sound? If it is a 'Public' soundboard, just drag-n-drop into a playlist. If 'Restricted', you can purchase the sound and then add it. This tab keeps track of every track or soundboard you have ever purchased or bought off our site. Also available online. For single tracks, drag-n-drop in your playlists. 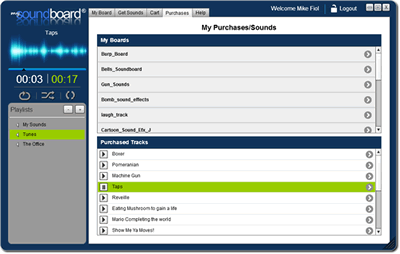 For 'full board' purchases, visit the soundboard, drag-n-drop any track on the board into your playlist.